You might remember last month we told you that Micromax was planning to launch entry-level 4G VoLTE handsets that are priced under Rs.3500. They have kept their promise and very quietly launched one of the handsets called Micromax Bharat 2 which is being sold in retail stores at a best buy price of Rs. 3,499. The actual price of the Micromax Bharat 2 is Rs. 3750. The information was leaked to the public by Mumbai-based smartphone retailer Mahesh Telecom on Facebook. 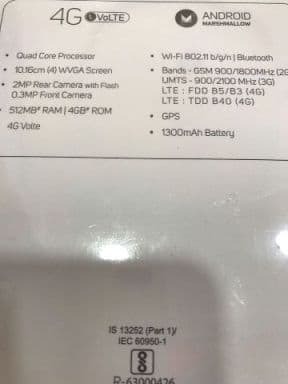 As you can see from the photos below the Micromax Bharat 2 has already made its way to retail stores even before it was unveiled on the official website. 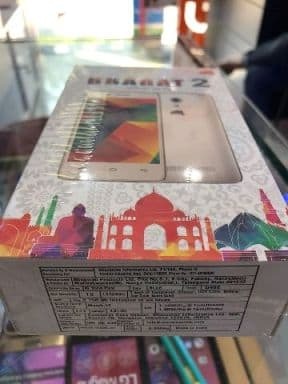 The Micromax Bharat 2 has been manufactured in India at a facility in Telangana. The Micromax Bharat 2 is available in Blue and Gold colour variants. The Micromax Bharat 2 sports a 4inch display which has a WVGA (800 x 480 pixels) resolution. In order the save costs the company has skipped on protective glass covering. The Micromax Bharat 2 runs with the help of a quad-core processor. Sadly the box doesn’t mention the chipset or the clock speed of the processor. The Micromax Bharat 2 has a 512MB of RAM which sadly wouldn’t suffice for multi-tasking. The internal memory of the Micromax Bharat 2 stands at 4GB. The box doesn’t mention if it has a microSD card slot or not but we predict that it has got one. The Micromax Bharat 2 is one of the few cheap smartphones that runs Android Marshmallow. The Micromax Bharat 2 has a 2MP rear camera with flash and a 0.3MP front camera. The Micromax Bharat 2 supports Wi-Fi, Bluetooth and microUSB connectivity. The Micromax Bharat 2 is powered by a 1300mAh battery which will last for around 8 to 10 hours of average use.